McAllen Fire fighter Abraham Soto rides on a city dump truck looking for flooded residents at Oak Terrace subdivision on Vine and Bentson on Thursday, June 21, 2018 in McAllen. 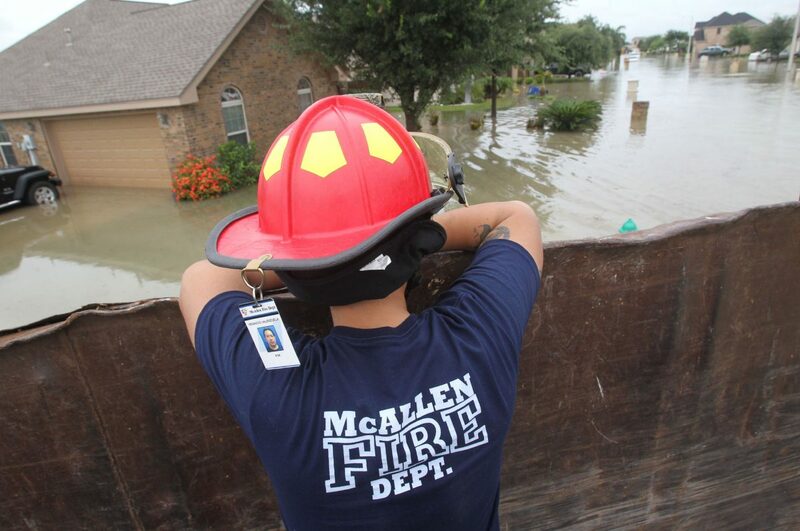 McALLEN — As the most rain fell in McAllen last week since Hurricane Beulah 50 years ago, 2,700 homes were damaged, but “miraculously,” the city is unaware of any injuries or deaths. No corner of the city escaped the rain storms last week, and about half of the city’s more than 30 departments were dispatched to assist with safety and rescue efforts, over the course of the week. The rain ended only days ago, but Kevin Pagan, who, in addition to being city attorney, is the emergency management coordinator, issued an in-depth report Monday night detailing the immediate fallout from the storms. Homes and businesses have amassed more than $650,000 in damages, Pagan said. To help with that, the city is hoping to receive a federal disaster declaration from President Donald Trump, who has not yet issued one. U.S. Reps. Henry Cuellar, D-Laredo, Vicente Gonzalez, D-McAllen and Filemon Vela, D-Brownsville, have all requested the declaration from Trump. The effort was boosted Tuesday by a joint letter to Trump from the state’s U.S. Sens. John Cornyn and Ted Cruz. Mayor Jim Darling met with Cornyn on Friday in Weslaco, to request assistance. A federal declaration would allow for residents to apply for individual assistance for their homes and businesses, Pagan said. Assistance has been deployed to the Valley from various volunteer organizations, Pagan said, and Federal Emergency Management Agency teams will be in town on Wednesday. The Affordable Homes of South Texas, Inc. is also offering home repair grants of up to $300 to homeowners. Residents in McAllen can visit the organization’s office to apply, and no insurance is needed. The city is also waiving permit requirements for repairs due to flooding, which will allow residents to get started on the repair process quicker. Over Pagan’s 15 years as emergency coordinator — including 6 inches of rain during a hailstorm in 2012 and 8.6 inches from Hurricane Dolly in 2008 — he said he’s been instructed in trainings to expect “something surreal to happen.” Last week was no exception. The city considered closing the McAllen-Miller International Airport due to flooding, Rodriguez said. It ultimately avoided that, but when calling around to different departments, airport officials said the facility wasn’t in good shape. Then the unusual part happened, Pagan said. “By the way, do you know about this VIP that we have in two hours?” Jeremy Santoscoy, deputy director of aviation, said, Pagan recalled. “We had a trip from the first lady of the United States in the middle of this (storm),” Pagan said.